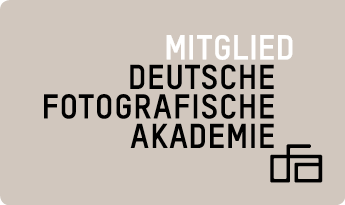 Am proud to have been invited to become a member of Deutsche Fotografische Akademie. Focussing solely on art photography, this invitation-only association has its roots in the ‚Gesellschaft Deutscher Lichtbildner‘, which was founded 1919. Great to be part of this illustrous club that features artist such as Dieter Appelt, Olaf Otto Becker, Boris Becker, Klaus Elle, Gottfried Jäger, Ursula Kelm, Jaschi Klein, Timm Ulrichs, Gerhard Vormwald, Sascha Weidner, Norbert Wiesneth and Wolgang Zurborn. And photo enthusiasts such as F.C.Gundlach, Celina Lunsford, Dörte Eißfeldt, Ingo Taubhorn, and Manfred Schmalriede.